4 Small Living Room Design Ideas | Havenly's Blog! 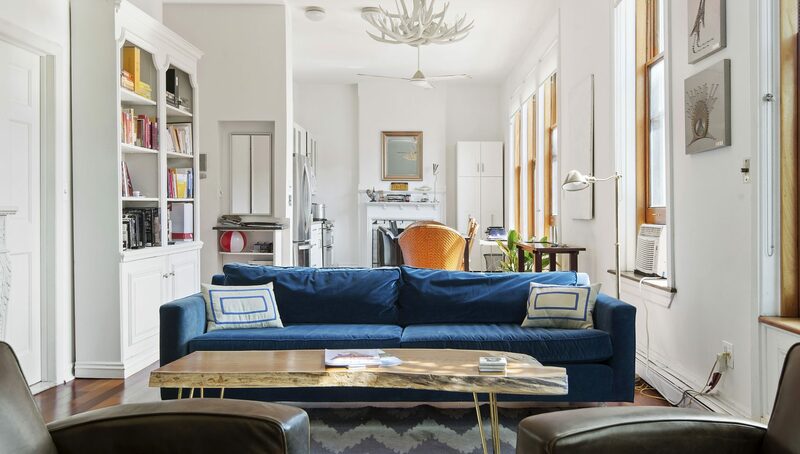 Small living rooms present a difficult design challenge. The space has to function as your main living area– that’s why it’s called the “living room”. But, the constraints of square footage mean that sometimes it can be hard to fit all of the necessary function into your space! But, we have a few small living room design ideas up our sleeves. Our number one designer tip is always consider the scale of your space while choosing your furniture! For a small space, use furniture that fits the scale of your room. Instead of an overstuffed armchair, pick something with more delicate lines. Don’t cram a huge sectional into your studio apartment if it blocks any sensible traffic pattern. Skip the deep media console and use a smaller sideboard to double up your storage options. Also, consider visual weight: dark, heavy woods will fill more space than pieces with lighter finishes and more open construction. Tons of brands are now focusing on furniture for smaller spaces, so these petite pieces do exist. Even Target has a line of furniture specifically tailored to smaller spaces! Repeat after me: use every space possible for storage. Buy a couch that’s skirted so you can hide a long, narrow bin underneath with your winter clothes. Stack books artfully under your coffee table. Need an ottoman? Buy one with a storage compartment for extra blankets. As we mentioned above, choose a media console with closed storage to hide away even more of your clutter. Get your things off the floor! If possible, install shelving. The higher the better: you can store your belongings vertically and take up less space. This works particularly well if you have a big collection of books or decor objects! Be sure to hang up your art, too. Small spaces are not the place to try the “gallery leaned against the wall” look. Hang up hooks for your pretty accessories, and create a landing pad with hooks for a jacket, bag, and keys. What makes a small space feel smaller is the sense that everything in the room is on top of something else. Let your belongings breathe- don’t cram seven pieces of furniture next to each other when you could use one multifunctional piece. Keep tabletops clear, and leave some negative space on your walls to let the eye rest between your art selections. Curating is tricky but a successfully edited space will feel airy and elegant regardless of its size. Still need help finding the perfect pieces for your small space? Work with a designer to customize your space.